How many people do you know that have failed and given up? How many of those people are happy? How many of those people took a risk after that? Are they successful? I’m willing to bet the answer is they’re not successful; they complain about life and don’t take any risks anymore because they feel they will fail again. You don’t succeed without failing because nothing is handed to you easily. The universe doesn’t just hand out success cards for free. You have to work hard for them. Do not give up! Life is meant to be filled with hurdles and the reward you receive when you overcome them is that it’s worth it. After all, how can you appreciate them if everything is handed to you on a silver platter? Learn what you need to know, realise your strength and you will accomplish everything you ever dreamed of. Success is not a lottery. It’s a game of risk and the risk is either you fail and get there by another route, or you fail and give up and inherently lose your chance at succeeding. 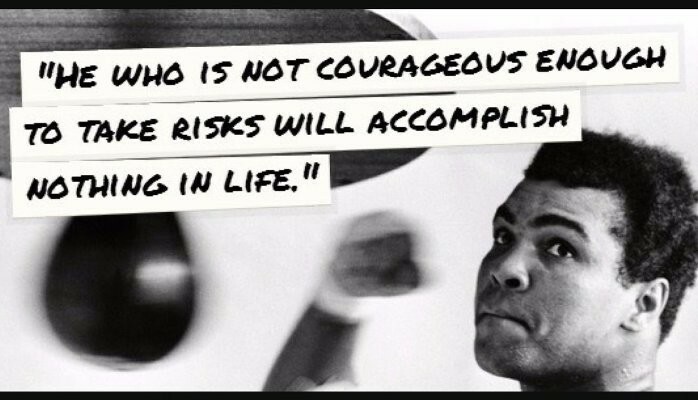 Be the greatest and take the risk.